That's the truth. 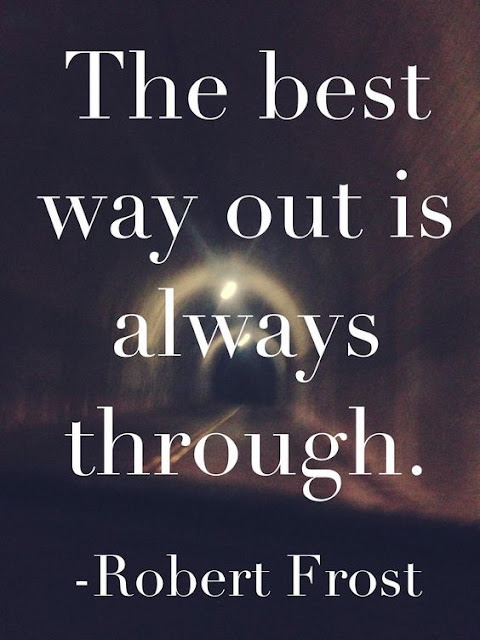 Whether it's something we're dreading, something we don't want to do at all, or something where we can't even see the pinhole of light at the end of the tunnel. Through is the only way. Given that, through is my word for this year. Inspiration struck me just as I sat down to write this post, really. There's been so many instances where I can't see the light at the end of the tunnel and I don't know how I'm even going to stay on the straight and narrow to find that light. Currently, we've just begun another deployment. Last year's five month "deployment" is really looking more like a romp in Europe as I stare down 2016. Those five months tested me in many ways and I know the tests for this one are just beginning. It'll be a lot longer than five months and I'm in that stage where I can't see the pinhole of light yet. And I'm not sure if I'm on the path that will lead to the end of the tunnel, or if I'm facing the wall or the wrong direction or something because I really can't see anything from here. I can't even think When he gets home or Next year or really anything past this month. I'm taking things one month at a time. Most days, I focus on just the week at hand so I can regroup on weekends. All this being said, I'm beyond grateful to have a full-time, meaningful job. Is it stressful to add that in? Yeah. Because everything is all on me. Arranging to be home if a repairman needs to do something, or if the weather is terrible it's on me to deal with, etc. Knowing I've got my own stuff to deal with at school (it's a whole different world than being at home) is oddly comforting because I know I'm using this time to serve a purpose, but it can all become a little overwhelming. Through spring, summer, and fall. Since I mark time in school years, I'm visualizing it as through this school year, potential summer school, and onto the next school year. VERY much like 2012. Through all those activities and things I do to mark time and occupy myself while he's not here. I'm getting through it, but I'm also trying to make the most of it because life does not stop during deployments and I'd rather use the time to do things than to not do things. At least if you go through something you can say you did it. That's really how I look at things these days. Did you pick a word for the year? I knew the right word would hit me eventually, even if it is March now. I think I needed to see what 2016 would be like before I chose. Goodness. This pulled at the ol' heartstrings. Often, we take for granted those that we love and are closest to. You sure have shined a light on one of the many reasons we should not take a loved one for granted. I know it sounds cliché and cheesy, but I appreciate the service your husband gives and the sacrifice you both make for that service. I think this is an amazing word to choose. I have yet to choose one that I feel is appropriate. I admire you SO much for being strong enough the handle all of this. Through is the perfect word. I love this post, and after following along with your journey for years, I must say that you truly are stronger than you know! Getting through deployments is not easy, but I think you are an inspiration to other military wives out there who have to go through the same thing. Keep your head up, girl- you can do it! That quote is 100% true. And through is a good word for you to go through this. It's hard to be the boss of all things with no one to take the load off of you. You have a strength dealing with this that is so admirable I don't even have the right words. I think "through" really describes almost every military experience we've had so far. Through a deployment, through a separation, through this terrible commander, through this PCS... so on and so on. I understand all too well how you're feeling. Hang in there! Robert Frost is amazing and so are you! :) Love this quote! :) I should hang that up on my bathroom mirror so I have to look at it every day. Such a great reminder!